I went out Saturday morning. My stream of choice was a tributary of the Androscoggin with a decent population of stocked and wild fish. The day started off really slow, as fish weren't really coming up for dries. I only got one bow on accident while my stimulator was skittering in the pocket below. The water temps had apparently fallen by about 3 ˚F due to the recent rains so that may have factored into the slow start. I switched over to nymphs and immediately caught fish in seemingly fish less pockets. Bows and browns were the norm early on but I got into a few native brookies upstream. 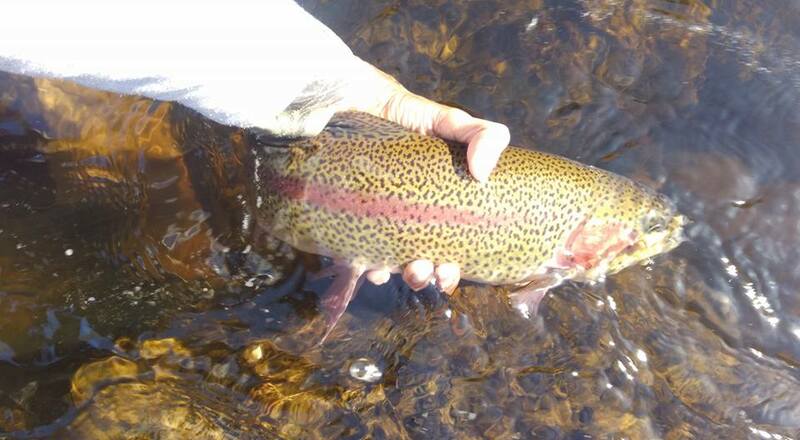 Some of the bows and both browns were recently stocked fish. A good number of the bows were wild fish. They seemed to have much lighter coloration than their hatchery raised counterparts. Once the clouds cleared and the sun came out, I tied an EHC stimulator back on and caught a mix of brookies and bows before heading out. The big scare of the day was when I knocked my phone into the river. It took me 2 hours to find it since it fell into some rapidly churning water. Ultimately, it ended up a couple feet downstream of where I dropped it and I avoided a huge scare. It cut my day short and limited the number of photos I could take but it could have been much worse. On my way home, I stopped at the Ellis for a few minutes. I caught a decent number of brookies and missed some more. For the most part, they were on the smaller size but the river was smaller in this stretch. All on the EHC stimulator.